Happy Valentines Day, I Love You (Yes, You)! My dearest Those White Walls family, Happy Valentine’s Day! These last (almost) 5 years with you have been the best journey and there's no one else I would rather be on this ride with. You are the first thing I think of in the morning, and the last thing I think about before I go to sleep. This job would be way less exciting if you guys sucked! ;) I am able to do what I do because of you and that, I will never take for granted. Thank you for supporting my dreams, trusting me, encouraging me and for always being kind and allowing me to make mistakes. I feel so lucky and honored to have you all here. p.s. Before I sign off, I wanted to take a second to talk about the most important person in your life... YOU. I know some single people dread valentine’s day, but my attitude is; why not be your own valentine (or in this case, be mine)!? I want you all to remember (it's something that I keep reminding myself too) that you have to first learn to find happiness in yourself before happiness can come from someone else. I really believe that if you're not happy within you, that no one else can bring you true happiness. So, put a smile on your face today, whether you are spending valentine’s day single, like me, or any other way. Let's work together to find happiness, love and contentment in ourselves and soon enough, we will each find it in someone else. I want you to know that I am always here for all of you. I know we may not know each other personally but you all mean so much to me. If you ever need anything, have questions or ideas, please feel comfortable reaching out! 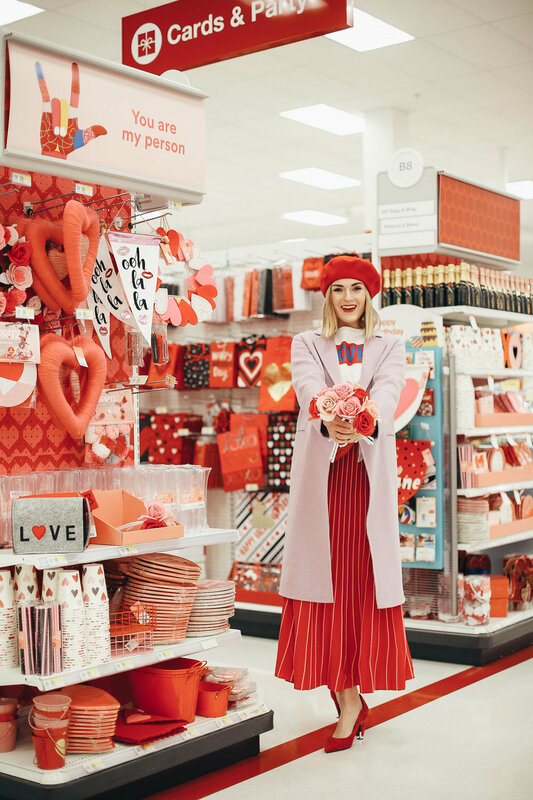 I'm just your average girl who goes to Target looking like a full fledged walking valentine.... HA! So, my sweet people, happy valentine’s day. I hope today is a great day. Big thank you to Sandro Paris for the perfect V-Day look!